I was inspired by a card I seen on Pinterest and wanted to use the SU set By The Tide which will be retiring when the new catalog comes out. I started with a Pumpkin Pie card base. The next layer is Lucky Limeade and then a layer of Marina Mist that I stamped the Hardwood background stamp in Stazon black ink and then distressed the edges in black. I distressed a piece of cheesecloth with TH Vintage Photo ink and then wrapped it around these two layers and then attached to my card base. Next I die cut 3 layered circles using my framelits from MFT, the largest in Lucky Limeade, the middle in Basic Black and the smallest in Whisper White. On the white circle I inked it with Soft Sky and Marina Mist using a direct to paper technique and then stamped the reef in both Pumpkin Pie and Cajun Craze. Now I layered all three together and added a clear window on top of the smallest circle and then attached these to the card front. I used my copper pearl pen and created the rivets on the largest circle. 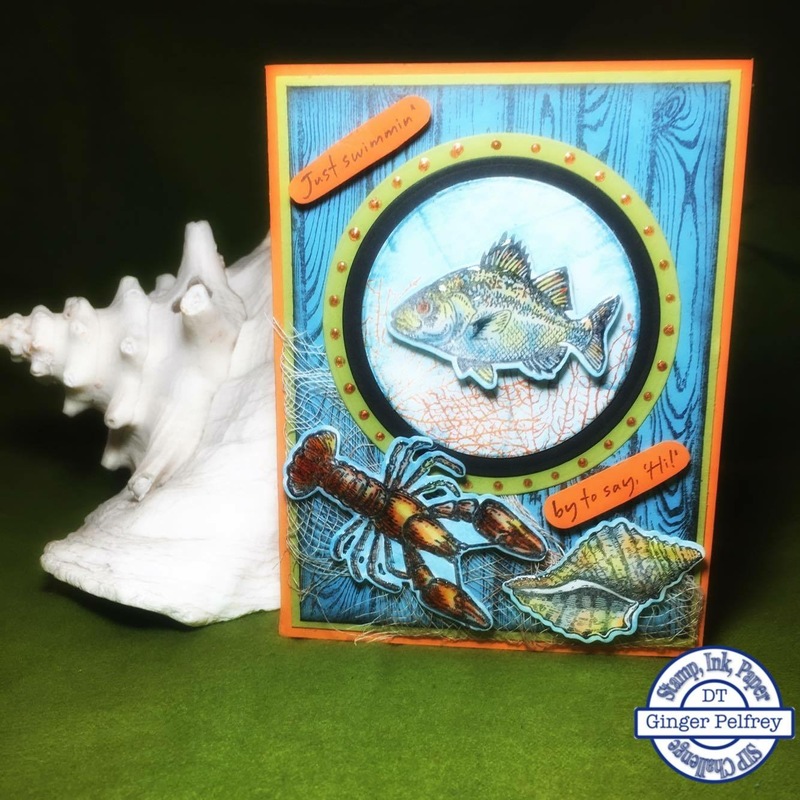 Next I stamped the fish, lobster and shell on watercolor paper using Stazon black ink and then die cut them using DiesbyDave framelits. Using a blender pen and the following colors, Pool Party, Soft Sky, Marina Mist, Pumpkin Pie, Cajun Craze and Lucky Limeade I colored in all the images. After they were completely dry I used Glossy Accents on them and then allowed that to dry and added them to my card front using dimensionals. To finish I stamped the sentiments from the set By The Sea Sentiments from MSE on Pumpkin Pie Cardstock and fussy cut them and added to the front using dimensionals. Thank you so much for stopping by today. 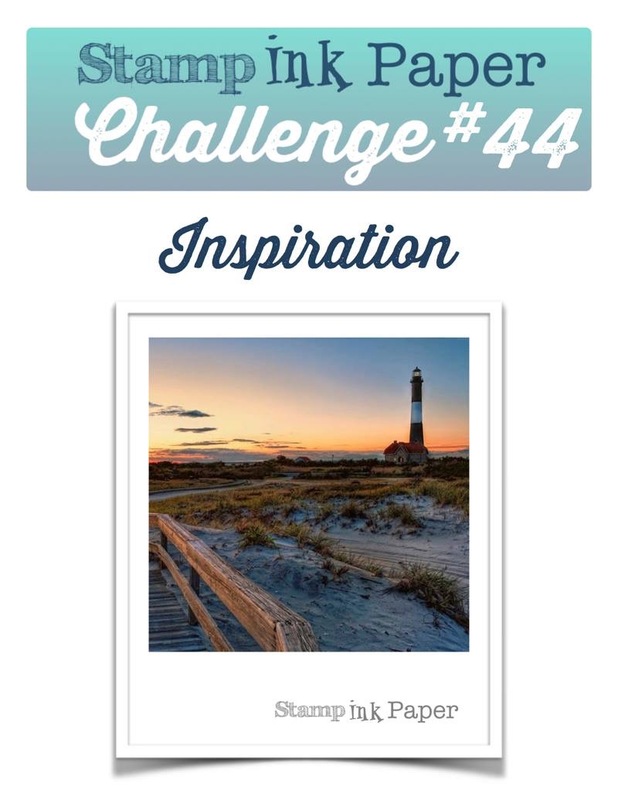 I hope you have enjoyed my card this week and have been inspired to play along with us! Categories: Stamp Ink Paper, Uncategorized | Tags: By The Tide, Cajun Craze, Cheesecloth, DiesbyDave, Hardwood, Lucky Limeade, Marina Mist, MFT, MSE, Nautical, Pool Party, Pumpkin Pie, Soft Sky, Stamp Ink Paper, stampin Up, Watercolor | Permalink.